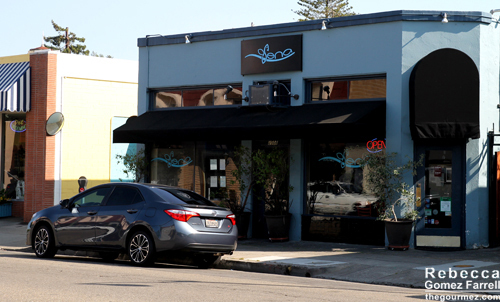 About a block off the central Park strip in Alameda, you’ll find this Mediterranean-focused, upscale dining spot. By Mediterranean, I mean all over the Sea with a menu featuring pasta, sour cherries, artichoke, hummus, and so on and so on. Whatever region you want of the Mediterranean, you’ll probably find something that qualifies. 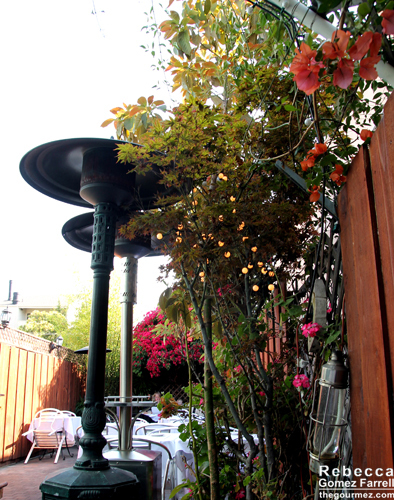 And if you’re sitting out on the flower-covered patio, you won’t mind if it takes a little while for your dining companions to arrive. Cocktail Round #1 saw us through that just fine. Husband and Cousin’s Boyfriend, who ordered one later on, described the ginger sake martini as so light, you forget how fast you’re drinking it. Good, but could be dangerous. The Monte Cristo presented an impressive blend of flavors for me. Campari, limoncello, Stoli, and pomegranate nectar was a sampling of the Mediterranean all in one glass! It was served over crushed ice, which kept it at a good dilution the whole way through, and the pomegranate brightness melded well with the bitter Campari. The limoncello provided an overall smoothness that made it taste similar to sangria in a way, though the Monte Cristo was much more my cup of liquor than most sangrias I’ve had lately. 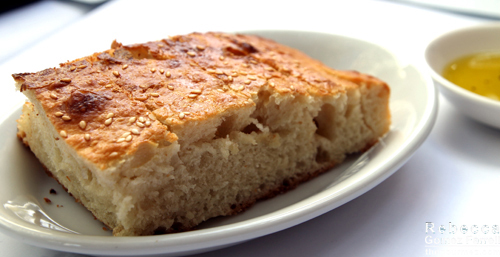 Our first round of bread was exceptional, featuring a dense focaccia with a Greek flair from sesame seeds. The second round was a less impressive version of that same bread, done more like a sandwich-loaf with less weight to it. So if you get that one, just wait, better bread may come! We decided to split a couple mezzes, being a hungry, hungry crowd. 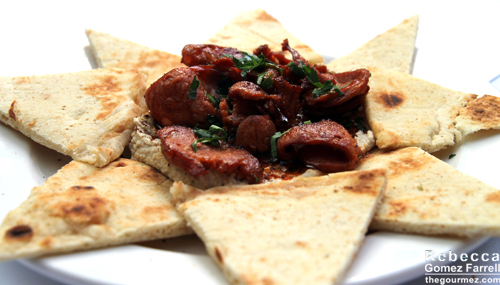 First up was the hummus with linguica and flatbread. Although the flatbread was a little dry and stale, that was my favorite dish overall. The fluffy hummus had great texture without so much oil that the garbanzo flavor was drowned out. It worked wonderfully in conjunction with the crispy, and generous, serving of linguica on top. 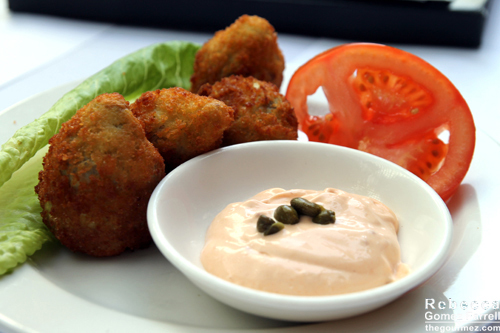 The fried artichoke hearts with lime aioli were also quite tasty, though I found the aioli too heavy on the mayo-side (yes, I know aioli is not exactly mayo, but that’s my basis of comparison). 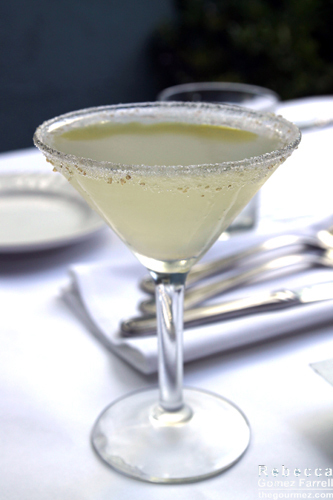 Yet the amount of lime in it was just right, contrasting with the artichoke’s buttery richness. 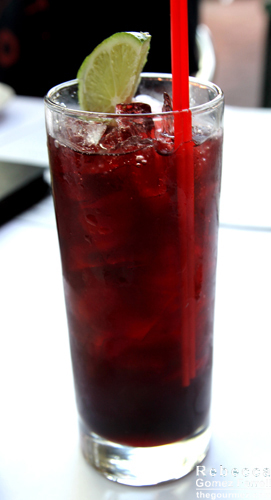 The hearts burst with juice upon biting into one. Note: three is the usual size of the order. Our waiter was wise to offer us four instead, as he figured we’d be fighting over them otherwise. I was impressed that we all ordered entrees after sharing those two mezzes…but as I said, we were hungry! I’m not going to describe my companions’ plates in detail, but I did take pictures. 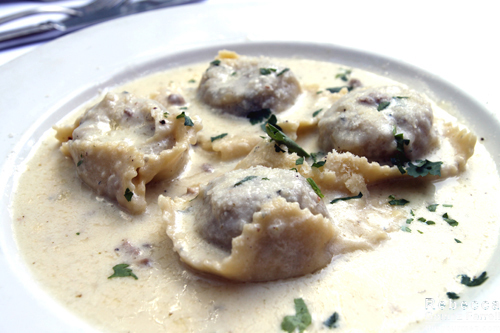 Special lamb ravioli in a brown-butter sauce: Husband thought it was fine, but he’s yet to be impressed by Bay Area cooking. Count that as evidence that we were quite spoiled with RTP’s flourishing food scene…or as proof that he’s the food snob in the relationship. Steak special with lime butter (no pic): Cousin gave the butter accolades, and she agreed with me that the vegetables were done well, meaning crisp-tender and seared rather than overcooked like many places do it. You have a steak and potatoes dinner, you almost expect the vegetables to be horrible. 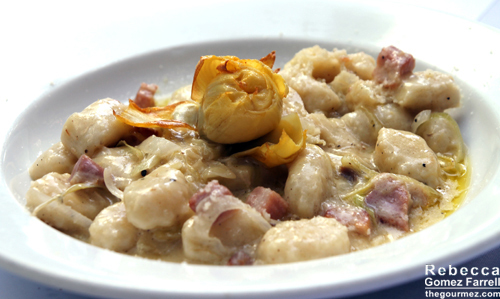 Gnocchi with cured pork, leek, artichoke, and EVOO: This dish made Cousin’s Boyfriend a believer in gnocchi. It was his first time trying them! The artichoke flower made for a pretty presentation. 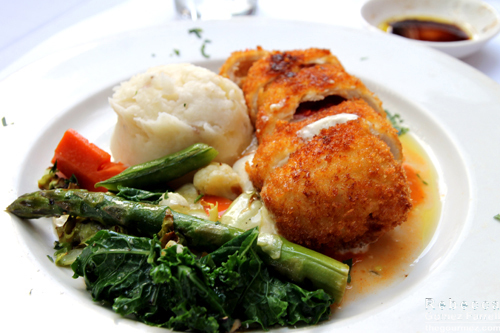 My entrée was a breaded Petaluma chicken breast stuffed with asparagus, fontina cheese, and pequillo peppers served with mashed potatoes and a sundried tomato coulis. That was a very nicely done dish, not at all your usual chicken entrée. The menu description didn’t mention the toasty coating of breadcrumbs or the mashed potatoes, and I had wanted something more lithesome than those two details would imply…but I was hungry, and damn, that was good chicken. Moist meat oozed with cheese, chopped asparagus, and peppers. The cheese did overpower the other stuffing ingredients, and the coulis could have been more buoyant in flavor to provide a nice counterpoint to the richness, but it was definitely satisfying, and I finished that plate with gusto. My favorite part was actually those perfectly cooked veggies: kale, more asparagus, cabbage, and carrots. Cousin and Cousin’s Boyfriend both could not resist the dessert special, a bread pudding with chocolate chunks and vanilla gelato. I couldn’t blame them for the lack of willpower. My one bite of the dessert confirmed a nice crunch on top and almost overwhelming richness from the chocolate and custard combination. 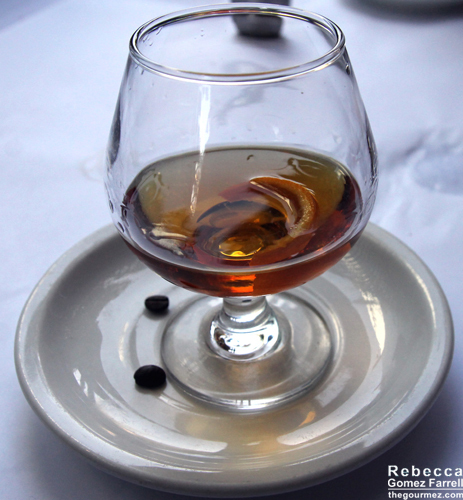 I opted for dessert in liquid form, having the French Connection, a Grand Marnier and Hennessy combo stewing with orange peel. 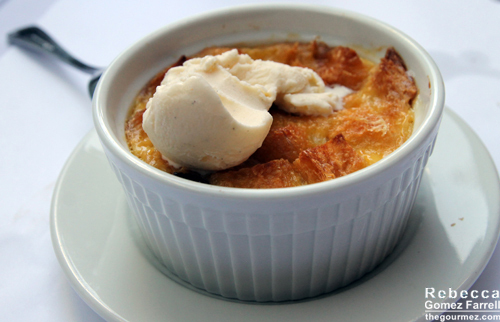 That’s a great combination for dessert, folks. I appreciated the sprinkle of coffee beans as well, though I would suggest that chocolate-covered beans would have been amazing. I want to give Asena a truffle because we were all so happy to be fed at last, but I do think it has room for improvement. It just doesn’t need much of it.